Be the first to share your favorite memory, photo or story of Arlo. This memorial page is dedicated for family, friends and future generations to celebrate the life of their loved one. Mrs. Arlo Mae Secrist, 95 of Bourbon, In passed away on Monday, April 1, 2019 in Millers Merry Manor, Warsaw. Arlo was born April 5, 1923 at Plymouth, IN to Ray E. and Mary E. Anglin Conger. 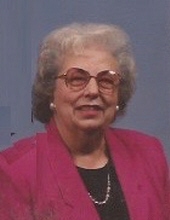 She was retired from R.E.M.C of Marshall County as an accountant and a 1941 graduate of Plymouth High School. In her spare time she loved painting pictures, reading, watching old movies and especially spend precious time with her family. She was a faithful member of Bourbon First United Methodist Church and attending when able. On July 17, 1948 she became the bride of Eugene M. Secrist who preceded her in passing on February 28, 2010. Those left to celebrate precious memories of Arlo are her four children; Lynn and Michael Gross of Warsaw, Karen and Richard Moriarty of Warsaw, Debbie Tucker of Evansville and Jeffery and Sherri Secrist of Rochester. she was also blessed with nine grandchildren and seven great-grandchildren. She was preceded in death by her parents, husband Eugene granddaughter Lindsey Marie Gross and two brothers: William and Robert Conger. The family will receive Friday, April 5th from 9 - 11 Am at Deaton-Clemens Funeral Home, 115 S. Main St. Bourbon, IN 46504. Funeral services will follow at 11AM in the funeral home with Pastor Mark Day and Pastor Ken Cook officiating. They asked that memorial contributions be made to a charity of your choosing. Deaton-Clemens Funeral Home is privileged to be entrusted in arranging the her services. To send flowers or a remembrance gift to the family of Arlo Mae Secrist, please visit our Tribute Store. "Email Address" would like to share the life celebration of Arlo Mae Secrist. Click on the "link" to go to share a favorite memory or leave a condolence message for the family.